Quirk Books, 2019. 143 pages. The only thing wrong with this book? Music is not included. All of this poetry was meant to be sung. And the only tunes I can partially remember are pretty much the songs I listed in the last paragraph. So I wish they had figured out a way to include the tunes. If not in the book, then maybe an accompanying CD? In fact, not all of the poems here were written by Fred Rogers. 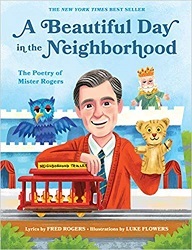 Several are listed with the tagline, “Lyrics by Josie Carey, Music by Fred Rogers.” These poems are very much in the same style and are from the show, but unfortunately, we don’t get to see Mr. Rogers’ contribution. It did dawn on me that “Everything Grows Together” would make a great song to sing at storytimes. It’s one of the few that I can remember the entire tune. So that will be my new little tribute to Mr. Rogers in my storytimes. Mr. Rogers packed a whole lot of wisdom into his simple songs. Reading them is a cheering thing to do. I love that they have been collected! Web of Life Children’s Books, Berkeley, California, 2017. 32 pages. This is one of those nonfiction books with big, cute pictures of baby animals – which make it an easy win for booktalking. The main story is of a rescued red-tailed hawk. She’d been shot and found with a broken wing. She’d never fly again. Kara Hagedorn is a zoologist who works at a wildlife center. She took care of the hawk, named her Sunshine, and bonded with her. Sunshine made a habit of laying eggs and sitting on them – even though they were infertile and would never hatch. Sunshine would take good care of the eggs – and expect Kara to help her – but Kara had to get rid of the eggs each summer to stop Sunshine waiting forever for them to hatch. But one year, Kara got two fertilized eggs from a local chicken farmer and placed them in Sunshine’s nest. 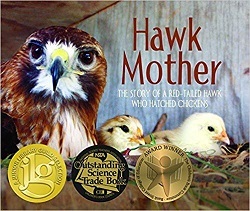 Even though in the wild, hawks kill and eat baby chickens, Sunshine adopted these as her own and cared for them until they became fully grown roosters. Sunshine’s inspiring story shows how we can all overcome challenges and adjust to new situations with the help of others! This lovely book tells a simple but heart-warming story and is illustrated with large photographs throughout. 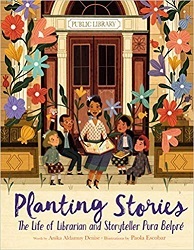 Here’s a picture book biography of Pura Belpré, who has a children’s book award named after her for outstanding works of literature by Latinx authors and illustrators. In 1921, Pura Belpré was the first Puerto Rican librarian in New York City. She was hired to find books and create programs at the Harlem branch that would appeal to the neighborhood’s growing Spanish-speaking community. Since Pura didn’t find any stories from Puerto Rico on the library shelves, she told the stories herself. She ended up creating puppets to go with them and authoring several books based on those stories. This book, with particularly beautiful illustrations, celebrates the difference a librarian made to an entire community, while telling more of the background of her life. I was glad to discover the story of the person honored by the award. Yes, she was someone who got stories into the minds and hearts of Latinx children. Here’s a fun picture book that tells about the invention of Band-Aids. It turns out they were invented by a guy named Earle Dickson who worked for a hospital supply company and whose father was a doctor. But that wasn’t enough. The reason he invented Band-Aids was that he had an accident-prone wife. When Earle’s wife Josephine cut her fingers, it was hard to wrap the wounds in a way so that she could still use her hands. So Earle thought of attaching a piece of sterile gauze to adhesive tape. Then she could easily tape a strip over her cuts and scrapes. But that wasn’t the end of the story. They still needed to manufacture the new adhesive bandages and then convince people to buy them. At first, they sold them in big rolls, and you had to cut off a piece before you could put it on a cut. They were also difficult to manufacture. Even when they got the idea of individually-wrapped bandages, it still took time to catch on. In fact, it was giving free samples to Boy Scouts and the military fighting overseas during World War II that made Band-Aids a household necessity. 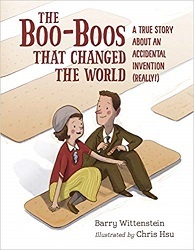 I like the way this picture book looks at the entire process of a relatively simple invention and explains how it was developed in a way that children can understand. I’m planning to booktalk this book in the elementary schools this summer. It has the hook of being a fun story about something everyone has used, and it also teaches what goes into making an invention popular. Roaring Brook Press, 2018. 48 pages. Here’s a picture book biography of Sojourner Truth, focusing on how she spoke up for Freedom. The words used are poetic and the pictures are full of beautiful resonance. Many spreads have a panel on the left side beginning with “In Slavery Time…” or “In Freedom Time…” along with an image. Isabella lived in a cellar where the windows never let the sun in and the floorboards never kept the water out. The book takes us through her many years in slavery, and then the story of how she got her freedom – and sued her former master because he sold her son out of the state of New York. But in Slavery Time, Broken Promises were like leaves on a tree. It tells about how she changed her name and began walking around the country speaking about Freedom and Truth. But the panels change after emancipation. Soujourner Truth told an audience in Massachusetts, “Children, I have come here like the rest of you, to hear what I have to say.” And what she had to say was plenty. 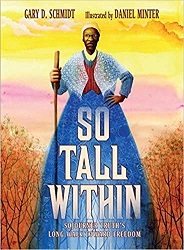 This book powerfully and poetically portrays a woman who rose from slavery to stand tall and change America. Houghton Mifflin Harcourt, 2018. 144 pages. This book has a prologue, with the heading, “The Girl in the Garden.” Quoting from it will tell you the background of Maria Merian’s life. A girl kneels in her garden. It is 1660, and she has just turned thirteen: too old for a proper German girl to be crouching in the dirt, according to her mother. She is searching for something she discovered days ago in the chilly spring air. As she combs the emerald bushes, she looks for other telltale signs – eggs no bigger than pinpricks, or leaf edges scalloped by the jaws of an inching worm. . . . But for years she has gathered flowers for her stepfather’s studio, carried them in, and arranged them for his still-life paintings. She has studied the creatures that ride on their petals: the soft green bodies of caterpillars, the shiny armor of beetles, the delicate wings of moths. She has looked at them closely, sketched and painted them. In learning the skills of an artist, she has learned to look and watch and wonder. Yet she is drawn to these small, mysterious lives. She does not believe the local lore: that “summer birds,” or butterflies, creep out from under the earth. She thinks there is a connection between butterflies, moths, caterpillars, and the rumpled brown cocoon before her, and she is determined to find it. The biography that follows tells of a woman far ahead of her times. She was both an artist and a scientist. She was an artist because she assisted her father and her husband and learned from them – she wouldn’t have been able to study on her own merits. She was a scientist by virtue of her own patient observations. She learned which caterpillars transformed into which moths or butterflies and which cocoon or chrysalis went with each. She made her observations known by painting them. She would paint creatures on the same plant where she found them, and she would paint a butterfly with its egg, caterpillar, pupa, and chrysalis in the same picture. This book is lavishly illustrated with Maria Merian’s own paintings as well as photographs of caterpillars, moths, and butterflies. Quotations from Maria’s writings are included, set off in a box and printed in script. Every spread has something colorful to catch the eye. 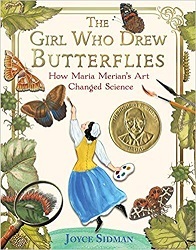 The structure of Maria’s biography follows the life cycle of a butterfly, with chapter titles: “Egg,” “Hatching,” “First Instar,” “Second Instar,” “Third Instar,” “Fourth Instar,” “Molting,” “Pupa,” “Eclosing,” “Expanding,” “Flight,” and “Egg” again. Joyce Sidman has written a poem for each chapter, placed next to a photo of a caterpillar or butterfly at that stage. Maria’s unique combination of observation plus art left a mark that affected scientists after her. After her death, Carl Linnaeus used her book to classify and name more than one hundred insects – names we still use today. The exquisite paintings and detailed photographs make this a beautiful book worth browsing – even if it weren’t packed with facts about an important scientist, a woman far ahead of her time. Source: This review is based on a book sent by the publisher. Boyds Mills Press, 2016. 40 pages. This is another picture book biography about a person I never heard of but am very glad to know about. Alice Coachman was the first African American woman to win an Olympic gold medal. She won in 1948, and had to miss the 1940 and 1944 Olympics, when she was at her peak, because of World War II. Born in 1922 and very poor, Alice faced many obstacles to living her dreams. Being black and being female were both obstacles to being an athlete. The print in this book is small and there are lots of words on the pages, so the intended audience is older than the usual picture book crowd. However, it’s in good company with other picture book biographies. The excellent picture book biographies written today are why I was happy our library created a children’s nonfiction browsing collection. This book isn’t designed for someone writing a report, but for someone wanting to read the true story of an inspiring person. And she is inspiring. I’m so glad this book exists so I could learn her story. The note at the back tells us more. Alice credits her success to the support she received from her family, teachers, coaches, and sometimes people she hardly knew. In an effort to give back and help others, she founded the Alice Coachman Track and Field Foundation, which supports young athletes and helps former Olympic athletes adjust to life after the games. Many do not know Alice’s story, since her gold medal came in the early days of broadcast television. 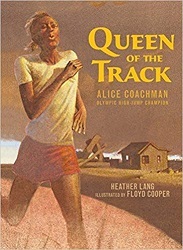 But it was Alice Coachman who paved the way for future Olympic track stars such as Wilma Rudolph, Evelyn Ashford, and Jackie Joyner-Kersee. Christy Ottiaviano Books (Henry Holt and Company), 2016. 32 pages. 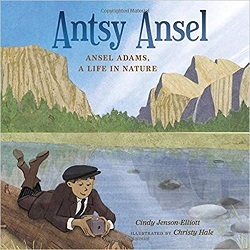 Here’s a picture book biography of Ansel Adams, famed photographer, especially of our national parks. The language is simple, appropriate for younger elementary school students. But a lot of information is packed into these pages, with more in the notes at the back. The author relates Ansel Adams’ life to kids by telling us he was a child who could never sit still. Indoors, Ansel felt trapped and sick. At school he got into trouble. Everyone thought they knew what he needed. “Keep him calm,” the doctor said, “away from light and sound.” Ansel yearned for wind and waves. “Give him discipline!” the principal said. Ansel felt like a fly buzzing inside a jar. Ansel’s father had a different idea. “Give him open air,” he said. He took thirteen-year-old Ansel out of school and let him learn at home. Ansel was on fire for learning. When Ansel was fourteen was when his family first visited Yosemite — and they gave Ansel a camera. I like the pages showing Ansel in Yosemite. The picture of Half Dome turns the book on its side to capture its tall majesty, as does a spread with a Sequoia. So this book is a nice introduction to the story of a boy who loved to be outside and learned to make his living by staying outside and sharing the beauty he saw with others. 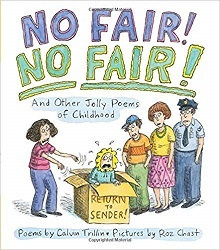 This is a book of poetry in the tradition of Jack Prelutsky and Shel Silverstein — rhyming poetry about the logic and illogic of children’s lives. And Claudia’s always the queen? But can’t they put the needle into someone else’s arm? If so, my older sister is the person I’d prefer. Could Jenny get this shot for me? I’ve done so much for her. You still won’t let me stay up late. I’ll say, “I’m eight,” but you won’t care. I have to admit, a few of the poems didn’t quite work as well read aloud — but the majority are so well done, they compel reading aloud. And Roz Chast’s pictures are the perfect companion! She gets a child’s eye view of the world just right — with that touch of cynicism and humor in every one of her pictures. Clarion Books (Houghton Mifflin Harcourt), 2016. 101 pages. 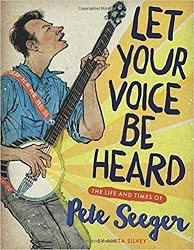 This is a straightforward biography of Pete Seeger for upper elementary audiences. There are plenty of photographs and the print is large and lines are widely spaced, so it’s not an intimidating amount of reading. I hadn’t known a lot about Pete Seeger’s life, and I was inspired. His approach to music — reviving folk songs, popularizing them, and collaborating with others — is partly what makes him such a likable character. But he also stood up for causes. He provided a voice — and songs — for the Labor movement, for anti-war protesters, for the Civil Rights movement, and for cleaning up the environment. But a big part of his life I hadn’t known much about was him being brought up before the House Un-American Activities Committee, and how much that impacted his life. I hadn’t realized how much was done against people suspected of Communist sympathies — in America. His life stands as a testament for social and political change, reminding everyone to fight for what they believe in and to let their voices be heard. You are currently browsing the archives for the Children’s Nonfiction Review category.